FILE - Joao Lourenco shows his ink-stained finger as he faces the media after casting his vote in elections in Luanda, Angola, Aug. 23, 2017. Angola's first new president in decades has a big job ahead of him: He inherits a nation mired in recession, plagued with corruption, and home to some of the worst income inequality seen anywhere in the world. Worse still, the falling price of oil — the nation's main cash cow — means that president-elect Joao Lourenco has limited means to dig his nation out of this difficult situation. 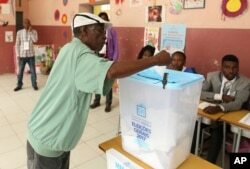 He also starts this historic epoch in Angolan history with a credibility issue, after four of the five opposition parties challenged the official results, saying they performed better than official results indicate. However, no one disputes that Lourenco's party, the Popular Movement for the Liberation of Angola, won the largest share of votes. He is the chosen successor of longtime president Jose Eduardo dos Santos, who is stepping down after 38 years in power. But his main challenger, UNITA leader Isaias Samakuva, says Lourenco did not win fairly. These results, he said, are too similar to results produced in a former election, in 2012. Opposition groups claim that the August poll suffered from problems from the very beginning, citing issues with voter registration, election day and vote counting. However, observers praised the poll as peaceful and orderly, and the opposition has not yet produced compelling evidence of irregularities. FILE - A voter casts his vote in elections in Luanda, Angola, Aug. 23, 2017. Angola analyst Paula Cristina Roque of the University of Oxford says the opposition's legal challenges are unlikely to be approved by the nation's highest court, as recently happened in Kenya. That's because Angola's Constitutional Court is largely seen as being beholden to the ruling party. That leaves the opposition with few options, she says. They could refuse to take their seats in parliament, or they could protest in the streets — a risky proposition, she says, considering the government's previous tendency to crack down on protests. The best strategy, she says, is for the opposition to let the MPLA slowly atrophy. The party, which has ruled since 1975, has lost about 10 percent of the vote in each of the last three elections, and has been accused of corruption and mismanagement. "Either way, I think that they have shown that they have grown in strength, but they have to be more strategic going forward, especially because in the next elections, the MPLA's hegemony will absolutely be challenged," Roque said. "We are in a totally different crossroads, crossroads that have been started with these polls. So this is an important historical turning point for Angola." But according to opposition spokesman Lindo Tito of the CASA-CE opposition coalition, the ruling party already has started playing its own political strategy by directing the electoral commission to ignore the opposition's complaints. "This is strategic," he said. "This is a political strategy, this is exactly a political orientation, why the national electoral commission doesn't look at the heart of the complaints." Roque says if Lourenco wants to succeed, he can't afford to ignore the opposition. "So in many ways, Joao Lourenco is facing serious challenges. And to overcome these challenges, he's going to have to reform," Roque said. "To reform, he's going to have to negotiate and also bring on board the opposition and their constituencies." Lourenco previously has dismissed talk of forming coalitions, as has Samakuval. But until this year, few Angolans believed their longtime president would ever leave office. And so, as Angola prepares for this momentous change, there may be smaller changes ahead, as well. Capita Inga contributed to this report.